The announcement was made in Alice Springs by Shadow Minister for Regional Communications Stephen Jones and Senator Malarndirri McCarthy and Warren Snowdon. In its announcement, Labor recognised the significant communications and connectivity challenges that communities living in remote areas already face, and the compounding affect that the ABC’s controversial decision to switch of its shortwave services in January 2017 had. It said that the loss of access to ABC services via shortwave radio cut Australians off from emergency broadcasts and connectivity with the rest of Australia. Labor’s announcement was received positively by the community. “Many thousands will benefit,” the Federal Member for Solomon Luke Gosling said on Monday after the announcement. Have your say on the future of Shortwave Radio in Australia! This is definitely a deal maker for me. I was disgusted by the decision of the ABC to kill the shortwave broadcast so there could be more digital services in the capital cities! Really? More? We don’t have any where I live and depend on the shortwave service for information when the local FM stations go off the air in a cyclone – as has happened in the past and will happen again! I keep two shortwave radios as part of my cyclone kit and without the ABC shortwave service will depend on the private service operated south of here and the Radio NZ International service. Both are great to have but it is not the same as the ABC redirecting their shortwave antennas to broadcast to us in a cyclone and provide continuous information during that crisis period. Bravo! Shortwave ABC should never have been closed down. Utilise DRM for better coverage and audio quality. Also bring back extended coverage to Pacific and South East Asia. Glad to hear the Labor party promised to re activate the shortwave transmitters so, the voice of Australia can once again be heard around the globe. It’s a shame for Australia not to have a voice in the world, when ‘good ol’ New Zealand’ is still broadcasting and letting its voice be heard in the Pacific. The politicians that silenced Radio Australia in the shortwave band, will do well to think, what will happen when the global internet links fail.. This is the only way that the country areas of Australia can receive communications , emergency warnings in times of need. It improves our social and cultural ideas. Liberals a&ere always trying too push you into something that costs money, nothing for free. Sounds good. Will it be DRM? I hope so for the improved quality and maybe a few grey nomads will tune in. Pleased that there’s support for restarting short wave broadcasting for remote communities and mobile travellers for whom any alternative is prohibitively expensive. I miss Radio Australia’s programmes over here in NZ and have worked in the outback in the past. 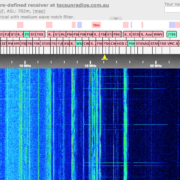 we need shortwave especially in the nt,i have lived and worked near the WA border.shortwave is a lifesaver. Those Australians who have been to NZ’s more isolated towns, and experienced the dreary free to air satellite TV and terrestrial AM radio programs there, will understand my frustration when ABC shortwave went silent. Previously thanks to fortuitous ionospheric propagation I was able to receive the ABC Alice Springs service right through the night. Besides Australia too many nations have fallen asleep and discontinued their individual voices over the worldwide reaching potential of the shortwave bands much to the delight of the Globalists who desire individual nations to relinquish their individual voices, opinions and unique cultures in favor of a one world government or order. It is my opinion that many of the world leaders have been bought and paid by Globalists to tear down their shortwave towers rand transmitters and go silent. Radio Canada International’s Senseless destruction of their very extensive shortwave facilities in sackvile Canada back in 2012 is a prime example of this. I do hope hat Australia does the right thing and gets back on the air soon their January 2017 pulling of the plug was a tragic mistake. Just ask China they are filling the voids and taking advantage of the great potential of world wide audiences the Chinese are not asleep they are indeed wide awake. Another equally important related issue for all Australians to discuss is that the Federal Gov. stupidly enforced removing the Australian Overseas Shortwave Broadcasting Service and so leaving only Radio NZ to support the South Pacific region. The South Pacific region low power local FM stations are usually not-operational after a cyclone has passed through the region. The Chinese quickly took possession of all Radio Australia’s scheduled frequencies . All overseas Radio Australia’s listeners promptly became China Radio International listeners!!!! Now the Federal Gov. is stupidly whingeing about the rapid increase in China’s influence in the South Pacific region.The Federal Gov. tossed the baby out with the bath water. I am not an Australian taxpayer, being from New Jersey on the East Coast of the US, but I have missed listening to Radio Australia, ABC, on 9,580 kHz in the mornings my time. There was always a strong signal here from about 0700 to about 1100 hours local time. I miss the “Waltzing Matilda” interval signal from many years ago. I especially miss Saturday Night Country, Saturday morning for me. I’m sure I’m sounding selfish, but so many countries have either cut back or have ended shortwave services altogether. Can I listen to ABC, BBC, CBC, RNZI, and the VOA online? Sure, but it’s not the same. I need signal fading. I need the crackling from approaching electrical storms. I’m 64 years old and I need analog radio. Bob I fully agree I started listening to radio Australia back around 1979 and I think it is tragic how it is no longer on the short wave bands . It is time for these governments to pay the power bills and fire up the transmitters once again Shortwave is reliable and is always there and very private no one can track what you are listening to as on the World Wide Web. if they put it back on i hope they only have a couple of frequencies.. in the past they have had so many that you cant get any other station.. its all over the place.. one frequency please is enough. The ABC board has cut off access to those areas that needed communication the most. Yet, the ABC calls itself the emergency service broadcaster. Well as long as the election promise is kept. There are also private options available. A law should be enacted to provide broadcasting services to the remote areas of Australia on shortwave. The ABC is also forced by law to provide the programming. Also there is a study going on with re opening Radio Australia, which is of course a separate issue and broadcasting into other nations, keeping the ABC away from International broadcasting, Department of foreign affairs or at the every least a Federal government department. Again the ABC under law provides the programming. I fully support this initiative for the re-establishment of Southern Radio on shortwave. it is a vital necessity for the information of the populations who only have the radio to be informed. Long live short wave broadcasting. The positive influence, within Australia and many countries, within reach of short wave transmissions, can’t be overstated. That it was axed was a mistake and it should be restored immediately. WE want ABC SW back. According to what I read on forums etc. AU’s SW service is right up there with the worlds best and most listened to services, what the bloody hell was the Gov. thinking about to cancel the service, don’t they know what people want. Thankyou TECSUN for your very good mail in keeping us up to date what’s happening. Keep up the good work, I look forward to your info.